"This remarkable set of essays defines the role of imagination ingeneral education, arts education, aesthetics, literature, and thesocial and multicultural context.... The author argues for schoolsto be restructured as places where students reach out for meaningsand where the previously silenced or unheard may have a voice. 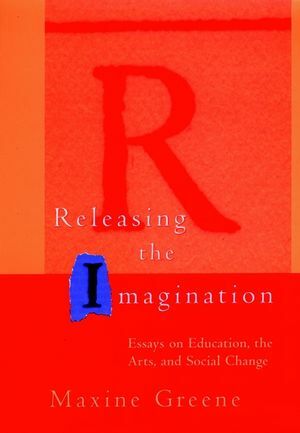 Sheinvites readers to develop processes to enhance and cultivate theirown visions through the application of imagination and the arts.Releasing the Imagination should be required reading for alleducators, particularly those in teacher education, and for generaland academic readers." "Maxine Greene, with her customary eloquence, makes an impassionedargument for using the arts as a tool for opening minds and forbreaking down the barriers to imagining the realities of worldsother than our own familiar cultures.... There is a strong rhythmto the thoughts, the arguments, and the entire sequence of essayspresented here." MAXINE GREENE is professor of philosophy and education and William F. Russell Professor in the Foundations of Education (emeritus), Teachers College, Columbia University, where she is also founder of the Center for the Imagination. She teaches at the Lincoln Center for the Arts. A past president of AERA, AESA, and the Philosophy of Education Society, Greene's previous books include The Dialectic of Freedom (1988) and Landscapes of Learning (1978).